Deja vu? 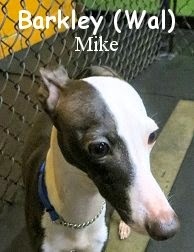 We had the pleasure of assessing another gorgeous Italian Greyhound today at The Fort. Meet Barkley! He is a one year old, fourteen pound, black and white colored Italian Greyhound. Although just slightly more "mild mannered" than Petey from Yesterday, Barkley, also tried our Medium Roll on for size... It was extremely fitting for him too! These Italian Greyhounds look delicate and can come off a bit fragile, yet the ones we've come across over the years, are anything but. They're all dog! Ready to socialize, play fearlessly, and have a good time. Physically their skin is thin, but luckily we've never had a problem with any of them "breaking it". Knock on wood lol. Scratches however, can show up more easily on skin/coats like theirs, and sometimes come with the territory of high-paced play. Mr. Barkley entered the play area somewhat bewildered. After Lucy arrived though, Barkley's demeanor did a complete three-sixty! As the two exchanged sniffs, they went from just meeting, to playing, in no time at all. Barkley's contentment and happiness progressed throughout his visit, as he got to know, and play with, several of our pack members. We look forward to Barkley's return, and think it will really be fun, if and when, him and Petey cross paths. Good times. We'll see ya at Fort Fido again soon Barkley!